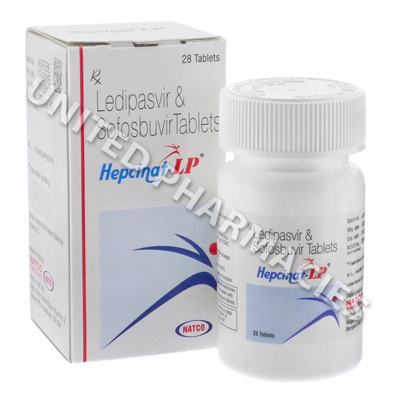 Hepcinat-LP (Hepcinat LP) is a combination of two potent antiviral agents - Ledipasvir and Sofosbuvir. It is indicated in the treatment of chronic hepatitis C virus (HCV) in certain patients. Hepcinat-LP prevents the spread of the HCV in the body, thereby decreasing the amount of HCV in the body. Take only the dosage prescribed by your doctor and follow all their instructions for taking this medicine. Hepcinat-LP is a tablet that should be swallowed whole with a glass of water. It can be taken with or without food. Most people take Hepcinat-LP without any unwanted side effects. If you feel unwell taking this medicine, contact your doctor as soon as possible. If you note any signs of allergic reaction (rash, hives, excessive itching, unusual difficulty breathing, tightness in your chest, or swelling of the mouth, face, lips, or tongue) contact your doctor immediately.